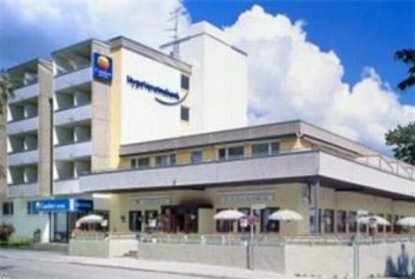 The newly 2006 renovated Hotel am Medienpark is centrally located in Unterfoehrign bei Muenchen within a few steps of the Medienpark. Munich city centre, airport, fairgound and arena easily accessible by public transportation (S8) which is nearby. Comfortable rooms are all equipped with bathtub, shower, WC, cable television with movie and sports channels (as well as Premier), telephone and Internet hook-up. Car and bus parking, and parking garage available. Restaurant and bar. Phone charge of 0.30 EUR.